I got schooled. East Coast boy, nothing gets past me. 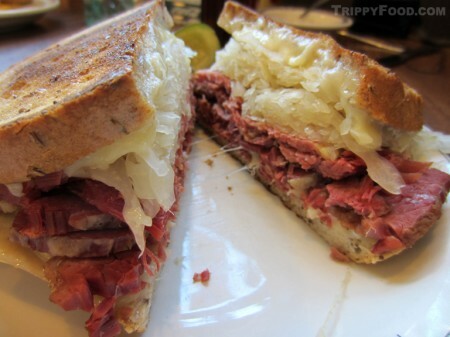 When the general question of where to get decent pastrami in the Los Angeles area on the Save the Deli Facebook page (hosted by David Sax, author of the book by the same name), I blurted out "Pasadena" like the meshugana goyishe schmuck I am. I've had Lucky Boy; Tops; The Hat... not bad, nice amount of spice, good flavor, but the ball is hit and goes right through Val Buckner's legs. "Valentino Herrera - that's the crappy pastrami I'm talking about. Those places are awful; you'll agree once you have a Langer", they said, over and over again until it rose to a deafening hum like the crowd in the house that Al Langer built. I've been to the Stage Door, 2nd Ave., The Carnegie but this is L.A. - I want a pastrami sandwich with a dish of neon green pickles and a nice bowl of matzo ball soup, not a pastrami taco - is that too much to ask? 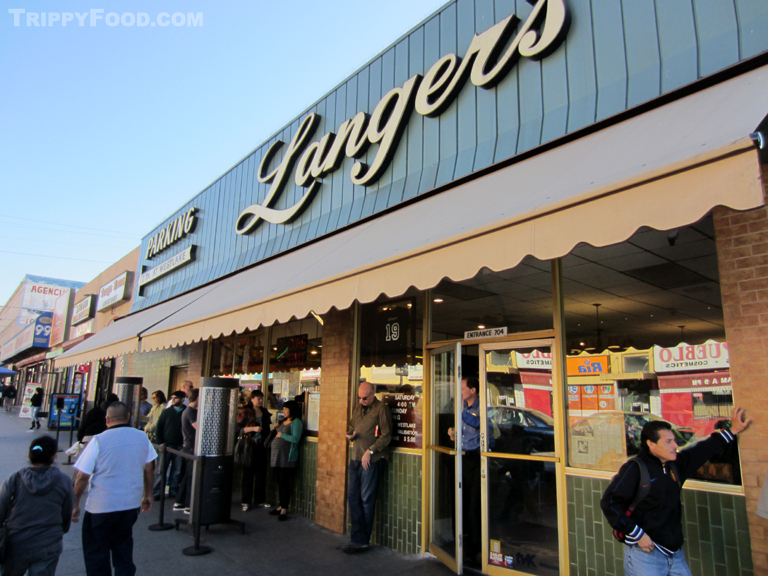 Well, it was time to roll up my sleeves and find out what the kvetching was all about; I contacted blogger friends Valentina (Eastside Food Bites), The Minty and Arianna Armstrong (GrapeSmart, Food Truck Times) and asked them if they wanted to participate in popping my Langer's cherry. Langer's is a bit of an odd duck. It sits on a corner of one of Los Angeles' busiest intersections (as it has since 1947) with its name in big letters contrasting with the predominately Spanish-language signs that populate the block; in fact the intersection is so dominated by Langer's that it has been officially dubbed Langer Square. I viewed the line going up the street as a good sign and met with my fellow journalists who had already jockeyed a place in line; we were seated at Table 1, which I also (initially) viewed as a good sign. The decor looks like it's changed very little since 1947; an odd, handmade sign behind the deli read, "Merry Christmas and Happy New Year" and at the front of the deli was a small electric sign with Celtic lettering reading, "Most Popular Sandwich #19 Pastrami, Swiss, Coleslaw, Russian Dressing" (a nice gentile sandwich, to be sure). 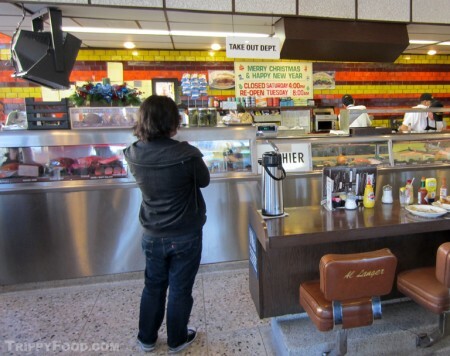 To the left where one can enjoy counter service while watching the cheerful insanity of the clean, white-shirted wait staff hustling orders was a vinyl-covered swivel stool with the name "Al Langer" emblazoned on the back; I wondered if you had to prove yourself worthy to occupy the late Mr. Langer's throne, but no one seemed to pay any mind to the gentleman stuffing a Ruben into his gaping maw. We started with soup by the cup (so as not to take up valuable real estate in our stomachs). The Minty's noodle soup seemed cooked well past al dente and there was a nice spattering of chicken fat bubbles on the surface; Valentina opted for the cabbage soup, a sturdy, tomato-based brew that was so thick it almost looked like kimchi. 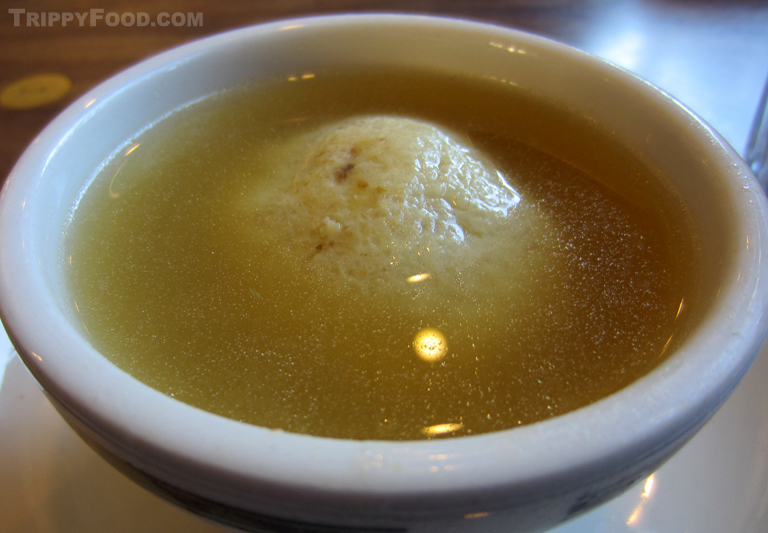 I felt I would be remiss to order anything but the matzo ball soup; the grain ball practically filled the entire cup - it was surrounded by a light, slightly salty chicken stock and had a texture not unlike firm tofu. I casually remarked how the obligatory bowl of dills hadn't miraculously appeared at the table; while we ordered the sandwiches, at least three of us blurted out, "Can we please get some pickles?” I'm guessing that during these times that try men's souls and wallets that delis are growing tired of tossing out the carefully brined cukes that remain uneaten (but probably not untouched) in the bowl. Although I found myself drawn to the come-hither of the sign with its slowly changing colored lights touting the virtues of the #19, I was thinking I wanted something a little simpler. The sandwich order was a symphony of brined beef - Arianna made the very sensible choice of a simple pastrami sandwich, allowing the meat to speak for itself. 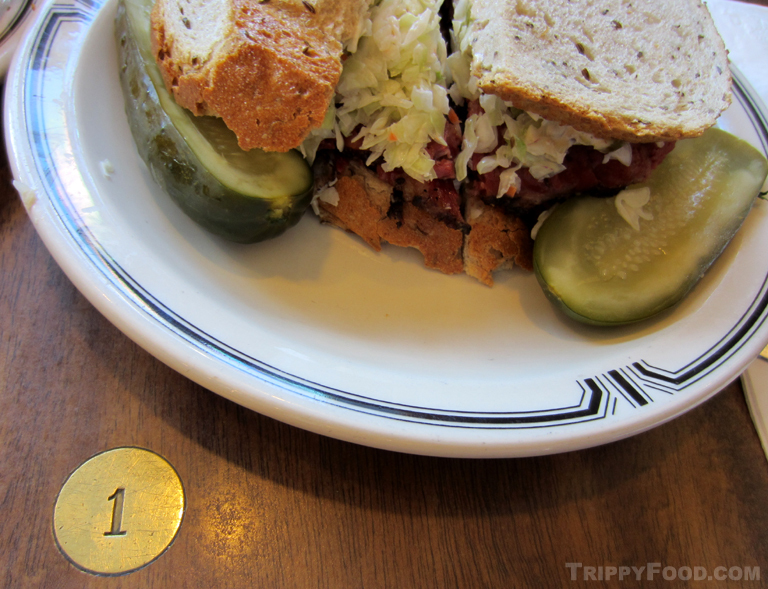 I went slightly upscale with the #1 (seeing as how we were seated at Table 1) - pastrami, cole slaw and Russian dressing (the latter of which I requested some restraint); I'm pretty sure that renegade Minty ordered the #3 (corned beef with Swiss cheese and sauerkraut). All eyes turned to Valentina, who brazenly ordered - wait for it - the Grilled Nippy Cheese. I'll give her credit, I'd be embarrassed just to say its name, but more power to her and her gooey, American cheese lava sandwich. This entry was posted in Southern California and tagged Al Langer, Arianna Armstrong, CA, cabbage soup, California, corned beef, David Sax, deli, Delicatessen, Eastside Food Bites, Facebook, Food Truck Times, GrapeSmart, grilled cheese, L.A., LA, Langer's, Los Angeles, Lucky Boy, matzo ball soup, noodle soup, Pasadena, pastrami, pickles, Save the Deli, The Hat, The Minty, Tops, Valentina. Bookmark the permalink.